*Administration terminated by fall of Confederacy. On June 12, 1865, Murrah vacated his office. Fearing retribution from the Federal Government, Murrah left Austin the next day and fled to Mexico with other Confederate leaders. 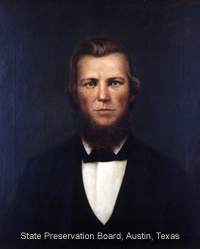 Lieutenant Governor Stockdale served as acting governor until June 17, 1865, when Andrew J. Hamilton was appointed Provisional Governor of Texas by President Andrew Johnson.